An ASBO New York analysis of new spending data shows that health care costs continue to pose a significant challenge to school districts. Growth in health care spending outpaced the growth in overall spending, Foundation Aid, and inflation. Six hundred forty-two New York State school districts completed filings to the Office of the State Comptroller. This research note analyzes the overall increase in proposed taxes, how many districts intend to ask their voters to override the tax cap, and the number of districts facing a negative tax cap for their 2019-20 budget. The Factbook was designed for use by state policymakers, especially state legislators. It includes maps of 674 school districts including the Big 5 city school districts in each legislative district and information on each school district including spending per pupil, state operating and building aid, and the percentage of each school district’s area that is included in each legislative district. 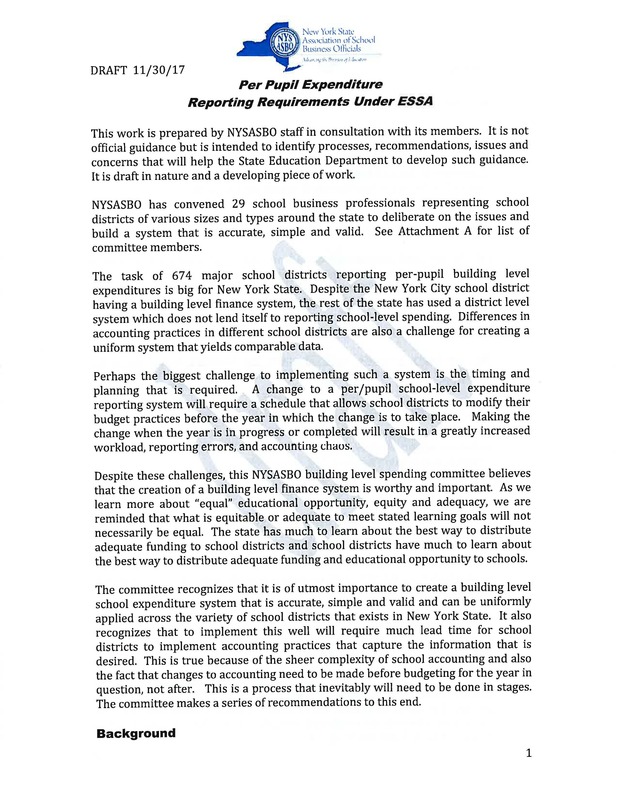 ASBO New York advances this aid proposal as a statement of New York school district needs from the unique perspective of school business officials. New York’s school business officials, who act as Education CFOs, are strategically positioned to understand education goals and the resources needed to achieve them. This report analyzes student need, student achievement, and school district finances in small city school districts. It explores the different rules small city school districts must operate by when calculating their debt limits, which impacts their ability to borrow or bond for capital projects like renovations or new construction. The report concludes with proposals that level the playing field and give children in small city school districts the opportunities they need to succeed. This report serves to frame the topic for ASBO New York’s 2018 symposium on weighted student funding. It provides background information on how weighted student funding addresses variations in student need and local resources, its use in state aid and school district-level funding allocation, and how state and district-level policies can promote funding practices that maximize achievement for all students regardless of need. This review presents research and guidance related to school level financial reporting including weighted student funding. The works cited address weighted student funding at the state, city and district levels, weighted student funding implemented internationally, the relationship of resources to economic and student outcomes, ESSA finanical reporting and school level budgeting. On June 19, 16 school districts presented their budgets a second time for approval by voters. Voters in each of these districts had failed to pass their 2018-19 budget proposals during the first budget vote in May. Three school districts saw their second budget proposal defeated and will be required to adopt contingency budgets with no levy increase for 2018-19. This school finance primer contains information on the number and types of P-12 public educational institutions, revenue sources for and spending on education, state aid formulas and components that drive aid to school districts, the Foundation Aid formula that directs the lion's share of school aid, and a summary of the 2018 state budget and its impact on school funding. A recent survey of our member school districts found that for 2018-19, the average individual health care premium increase will be 5.5 percent. This report analyzes the trend of growing health care costs and finds that health insurance premium increases far exceed increases in total school district spending and inflation in every region of the state. On May 15, New York communities passed 658 out of 674 budgets proposed by their local boards of education, continuing a trend of widespread support in school budget votes, although the overall passage rate of 97.6 percent is below last year’s record of 99.3 percent. This report looks at the trends in turnout, tax cap overrides, negative tax caps, and regional variations in turnout and support over time for 669 major school districts and five minor school districts. In budgets approved by boards of education, independent school districts propose an overall spending increase of 2.7 percent and a levy increase of 2.4 percent. In the enacted 2018-19 state budget, state aid to school districts for the 2018-19 school year increased 3.4 percent. This research note analyzes the overall increase in proposed taxes, the number of districts facing a negative tax cap, and how many districts intend to ask their voters to override the tax cap. ASBO released its 2018-19 State School Aid policy report, which calls for a $1.4 billion increase in formula aids as well as targeted increases for Community Schools Aid, CTE, child nutrition, and ELL categorical aid, as well as incentives for shared pupil transportation. ASBO has released a report showing English language learners in New York’s public schools are growing in number and are highly concentrated in school districts that also have large numbers of economically disadvantaged students. ASBO has released a report on students with disabilities in New York’s public schools that shows diagnosis rates, achievement, and spending are closely linked with student poverty and local wealth. This report, prepared by school business professionals in concert with ASBO, presents recommendations, issues, and concerns in developing per-pupil building level expenditures for the 674 major school districts in New York State. ASBO has released a report focusing on the prevalence of poverty throughout New York State. While overall enrollments are declining – 89 percent of districts lost students in the past 10 years – school districts are burdened by increases in economically disadvantaged students that have emerged from the Great Recession. ASBO has released an analysis focusing on demographic trends for groups of students who have historically faced significant achievement gaps: economically disadvantaged students, students with disabilities, and English language learners. ASBO has released an analysis of spring 2017 results in English language arts and math. While student proficiency increased over 2016, troubling achievement gaps remain. Proficiency rates in both ELA and Math are significantly lower in high-need school districts. ASBO has released a brief report entitled Demographic Challenges Facing Rural Schools: Declining Populations and Growing Poverty. The report analyzes demographic trends in New York State to highlight the challenges facing rural school districts and their communities. ASBO released its annual School District June Budget Re-Vote report, which analyzes data from the State Education Department regarding school budget votes that occurred across the state on June 20. ASBO released its annual School District Budget Votes report, which analyzes data from the State Education Department regarding school budget votes that occurred across the state on May 16. Yesterday's school budget vote continued the recent trend of 99 percent approval rates for Tax Cap compliant budgets. Only 12 districts proposed overrides, the lowest number since the creation of the Tax Cap. 75 percent of override budgets passed and two of the three failed budgets received more than 50 percent support. ASBO has analyzed Property Tax Report Card data for the 2017-18 school year submitted by school districts to the State Education Department. The Property Tax Report Card data details expected changes in tax levies, proposed spending, and student enrollment for the coming school year. ASBO has analyzed information that school districts are required by law to submit to the Office of the State Comptroller (OSC) on their tax cap calculations and proposed taxes for school year 2017-18 budgets. Of the districts that have submitted information so far to the OSC, 98 percent of them have proposed to stay within their respective tax caps. ASBO has released a new report entitled Achievement and Resource Gap Widens: More Students Left Behind. The report examines the connections between student outcomes and school funding. ASBO Releases Analysis of School District Spending - The Education Dollar Where Does The Money Go? ASBO has released its annual report on school district spending. The report examines school district spending and funding from school years 2005-06 to 2014-15. The study identifies a shift in the state and local shares of funding our public schools, the continued disparity in resources between high and low need districts, and the disproportionate long-term growth of school spending in non-general education categories. ASBO released its 2017-18 State School Aid proposal, which calls for a $1.9 billion increase in formula and categorical aids as well as targeted increases for CTE education, school nutrition, prior year adjustments and strategic resource planning for an additional $157 million in state support. ASBO released this week a report on New York State Foundation Aid with recommendations for legislative action for school year 2017-18. The report is the result of seven months of work by the ASBO Foundation Aid Task Force, comprised of 17 school business officials from around the state representing high, medium and low need school districts. The report will be discussed at a Symposium sponsored by ASBO and the Rockefeller Institute of Government on October 18. ASBO released its annual School District Budget Votes report, which analyzes data from the State Education Department regarding school budget votes that occurred across the state on May 17 and the nine re-votes that occurred on June 21. This year, 99 percent of budgets passed at the first opportunity— that continued a trend of passage rates above 90% that started with the advent of the Great Recession. However, this year saw a jump in the number of attempted tax-cap overrides—36 attempts in the May vote, up from 19 last year. Read the report here. The State Education Department released Property Tax Report Card data for school year 2016-17 on May 3. The Property Tax Report Card includes information on the change in tax levies, proposed spending, and enrollment for 669 independent school districts. The fiscally dependent Big 5 city school districts are not required to file this information and are not included. To give context to these multi-year data, we also note the point in time when two caps were added to the laws governing school finance: a tax cap limiting local revenues for education, and a state aid cap limiting the growth in state aid to the growth in personal income, subject to override by an act of the legislature and approved by the governor. We examined data, where possible, from school year 2010-11 to 2016-17. We conclude with recommendations informed by these data. This ASBO report shows the negative impact of a record-low property tax cap for 2016-17. Our analysis shows that 520 districts have tax caps below two percent and 82 will have negative levies. Tax cap changes reported by individual school districts ranged from -20.7 percent to 38 percent. Districts are proposing an average increase of 0.9 percent in their tax levy for next year. Fourty-two districts are seeking overrides. The Factbook was designed for use by state policymakers, especially state legislators. It includes maps of 674 school districts including the Big 5 city school districts in each legislative district and information on each school district including spending per pupil, state operating and building aid, and the percentage of each school district’s area that is included in each legislative district. Again this year data are included for each school district on outstanding Gap Elimination Adjustment (GEA) reductions and Foundation Aid still due to fully implement the foundation formula enacted in 2007. ASBO released its 2016-17 School Aid Proposal which calls for a $2.3 billion increase in school aid that would improve adequacy, equity, and transparency so that districts can provide students with the opportunity to graduate career and college ready. ASBO released its first annual Legislative Report Card that grades state legislators on their votes on funding proposals and legislation that impact school finances. The study identified that school spending moderated considerably since 2009 (the onset of the Great Recession) and continued under the Tax Cap. The report also highlights the continued disparity in resources between high and low need districts despite several years of school aid increases. This is a compilation of ASBO reports relating to the 2013-14 School Year. Changes to the New York State Tax Cap: What are they and what is the potential benefit to school districts? The 2015 legislative session concluded with two adjustments to the Tax Cap that reflected priorities of ASBO and the Education Conference Board. The changes relate to excluding school district local capital expenditures for BOCES instructional space and counting payments in lieu of taxes from tax exempt properties in the calculation of each school district’s allowable tax levy limit. ASBO, released its analysis of the 2015 School District Budget Vote Results. ASBO, released today its analysis of the 2015-16 Property Tax Report Cards submitted by school districts to the State Education Department, which details school spending, tax levy and enrollment data. ASBO, released its analysis of the 2015-16 state budget on April 9, 2015. This report provides a fiscal snapshot of the financial condition of New York State school districts, as part of a continuing series of ASBO studies. It presents data from 667 independent school district annual financial reports and personnel master file for the 2013-14 school year. The Factbook was designed for use by state policymakers, especially state legislators. It includes maps of the school districts in each legislative district as well as information on each school district including recent budget results, spending per pupil, state operating and building aid, and the percentage of each school district’s area that is included in each legislative district. New this year are data for each school district on outstanding Gap Elimination Adjustment (GEA) reductions and Foundation Aid still due to fully implement the Foundation Formula enacted in 2007. ASBO released an analysis of school district spending and revenues. The study examined school district spending and funding over a ten-year period. The study identified both a shift in the state and local shares of funding for public schools and the disproportionate growth of school spending in non-general education categories. This report provides a primer of New York State school finance. It includes a description of the number and different type of school districts in New York State, revenue sources for public schools, where the education dollar is spent and the growth in school spending over the years. It describes how major state aid formulas work and factors that have driven aid to school districts over the years, the Foundation Aid formula that was enacted into law in 2007, legislative action for 2014 pertaining to state aid to school districts and tax relief, and school finance issues from the point of view of education. Tuesday in June. At the revote, a district may either submit the same budget proposal, or a revised one. If the proposed budget was defeated again, the district must operate on a contingency budget. A contingency budget is limited to the same property tax levy as the previous year. ASBO released an analysis of the results of school district budget votes on May 20, 2014. Using the 2014-15 legislative data files, we examined the impact of the budget on New York State school districts. We examined impacts of total aid, foundation aid and the Gap Elimination Adjustment and its restoration for school districts grouped by region and by need and resource capacity category. ASBO recently released a report that examines the history of school district mergers, current trends, obstacles and recommendations for the future. This study examined recent data to determine whether school districts are on the road to either educational or financial insolvency or both. The report focused on professional staffing losses and fund balances maintained by 671 New York State school districts excluding the Big Five city school districts. The NYS School District Factbook was produced by ASBO and made specifically for use by NYS legislators. It includes maps of the school districts in their legislative district as well as information on each school district including recent budget results, spending per pupil, state operating and building aid, and the percentage of each school district’s area that is included in their legislative district among other relevant data. This proposal makes recommendations to support the critical path of school district leaders, including boards of education, superintendents, business officials and instructional leadership, to prepare students to be college and career ready. "The first round of school budget votes for the 2013-2014 school fiscal year took place on May 21, 2013 for 676 districts across New York State. Out of 676 school budget votes, 644 or 95.3% passed and 32 or 4.7% were defeated in the first attempt..."
This report looks at the unrestricted fund balances (or “savings”) of School Districts throughout the state in order to provide a clear picture of the fiscal health of our educational system.